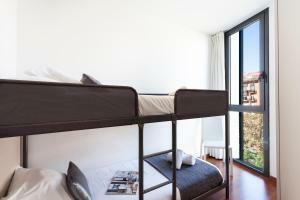 Offering apartments with balconies and free Wi-Fi, Apartment Barcelona Aragó Executive is less than 15 minutes’ walk from Urgell Metro Station and Plaza de Catalunya. These well-equipped apartments feature contemporary décor. 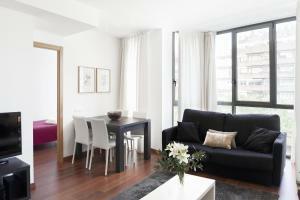 All air-conditioned accommodation at the Apartment Barcelona Aragó Executive is bright and has wooden flooring. Each attractive apartment has a spacious living room with a flat-screen satellite TV, as well as a kitchenette with an oven, fridge and microwave. Apartments also include a Nespresso coffee machine with mineral water, a selection of Nespresso capsules and a variety of teas. The private bathroom features. Staff at the reception can provide services like tourist information, bikes rental, airport shuttle and a tickets service. Babysitting is available upon request and there is 24 hours reception with complimentary water, tea, coffee and pastries and luggage storage. There is a supermarket just 5 minutes’ walk from the Aragó. A selection of restaurants can be found in Barcelona’s Gothic Quarter, less than 1 km away. Las Ramblas is a 20-minute walk away. 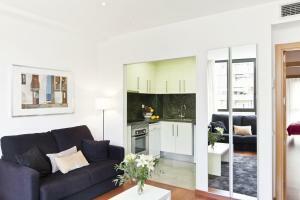 This spacious and luminous apartment comes with 2 bathrooms and 2 bedrooms that open up to a shared balcony. 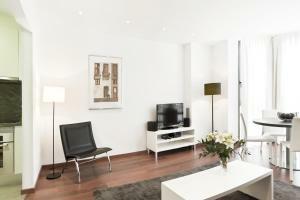 The apartment is equipped with air conditioning and heating, satellite TV and DVD player, music player and free WiFi. 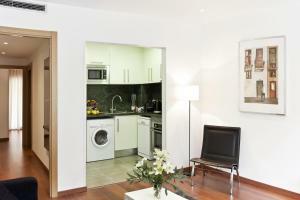 The fully equipped kitchen includes a Nespresso coffee machine, dishwasher, washing machine and dryer. The living and dining room feature large bay windows. Rate: € 136.80 ... € 177.60; select dates below to get current rates. This spacious and bright apartment comes with 1 bathroom and 1 double room and 1 room with bunk beds for 2 people, both sharing a balcony. 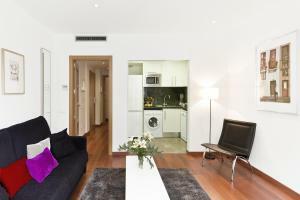 The apartment features air conditioning, heating, satellite TV and DVD player, music player and free WiFi. 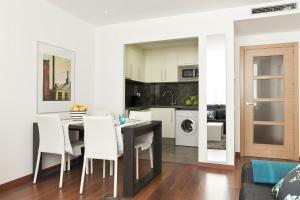 The fully equipped kitchen has a dishwasher, Nespresso coffee machine and washing machine. The living and dining room feature large bay windows. Rate: € 144.00 ... € 200.67; select dates below to get current rates. This bright and spacious apartment features a fully equipped kitchen, a private bathroom and free WiFi. 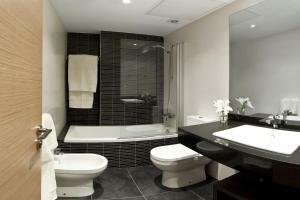 It comes with 1 double room, 2 single rooms and 2 bathrooms, one with a hydromassage shower. The living area includes a sofa bed. Featuring wooden floors and modern furniture, the apartment comes with 1 double room with a balcony with views to the interior yard. 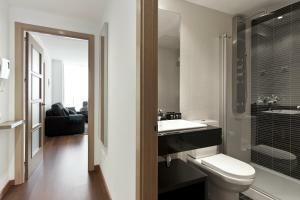 There is 1 bathroom with a shower, a living-dining area with a sofa bed and a kitchenette with a washing machine. Rate: € 174.00 ... € 280.00; select dates below to get current rates. Rate: € 124.00; select dates below to get current rates.